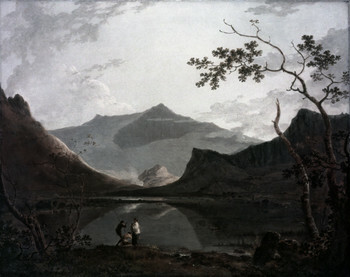 ^ Born on 01 August 1713: Richard Wilson, Welsh Romantic painter, active in Italy and England, specialized in Landscapes, who died on 15 (11?) May 1782. — He was one of the earliest major British landscape painters. His works combine a mood of classical serenity with picturesque effects. In 1729 Wilson studied portraiture under Thomas Wright in London and after about 1735 worked on his own in this genre. From 1746 his work shows a growing interest in landscape that, soon after his arrival in Italy late in 1750, became almost exclusive. Staying at first in Venice, he met the landscape painter Francesco Zuccarelli. Early in 1752 he went to Rome and became part of an art circle that included the painters Joseph Vernet and Anton Raphael Mengs. He remained in Rome until 1757, working mostly for aristocratic English tourists. He produced not only large landscapes in the manner of Nicolas Poussin, Salvator Rosa, and Claude Lorrain but also numerous drawings of Roman sites and buildings, which he used in composing Italianate landscapes after his return to England. The finest of these is a set of drawings made for Lord Dartmouth and dated 1754. They show how Wilson tempered his delicate observation of light and distance with the discipline of such 17th-century classical Baroque painters as Poussin and Claude. Returning to London probably in 1757, he became influential as a teacher and, after 1760, as an exhibitor with the Society of Artists and the Royal Academy. He was a founding member of the academy in 1768 and, from 1776, its librarian, a post he took to relieve his poverty. Though continuing to produce Italian landscapes, Wilson now turned to depicting his own country, Wales, and also the rural environs of London. The order and clarity rather than the classical apparatus of Italy survive, and Wilson's exact and tranquil recording of clear or suffused air, distance, and varied lights predominates, as in his famed Snowdon. His landscapes of this period exerted considerable influence on J.M.W. Turner, John Constable, and John Crome. Wilson's later works, such as Minchenden House, tend to abandon formal composition, using tonal methods of recording space. Many works ascribed to him, especially late ones, are partly the work of his students. — He began his career as a portraitist who also painted landscapes but committed himself to the latter genre in the early 1750s while in Italy. He painted and drew Italian scenery and idealized classical landscapes not only in Italy but after his return to England, only later developing this manner to include British scenery too. He was also influenced by Dutch landscape painting, particularly the work of Aelbert Cuyp. Wilson was a founder-member of the Royal Academy and enjoyed considerable success until the early 1770s, but his last years were penurious and his reputation in decline. Through William Hodges [1744 – 06 Mar 1797], a former student who published a short essay on Richard Wilson in 1790, and through other ex-students (notably Joseph Farington and Thomas Jones), the status of Wilson�s work improved; gradually it began to influence the artists of J. M. W. Turner�s generation. — Wilson started out as a portrait painter, the only way to make a living as an artist in England in the mid-18th century, but the competition from the likes of Reynolds and Gainsborough must have been formidable. Whereas Gainsborough's success with portraits inhibited his pursuit of landscape, Wilson's lack of success in the portrait field may have encouraged his development as a pioneer of landscape in Britain. Wilson's typical landscape style is quite distinctive. A tree with delicate foliage in the foreground. A stretch of water and a classical building in the middle ground. Tiny people and animals go about their everyday work or play, dominated by the landscape around them. And those glowing Wilson skies that are common enough in real life in North Wales and equally inspiring. Wilson gave people what they wanted. If they wanted Salvator Rosa bandits, or a Vernet seascape, or a Lambert topographical scene, or a Kneller- (or even Rembrandt-) style portrait or a Claudean scene from Ovid, Wilson could do it. 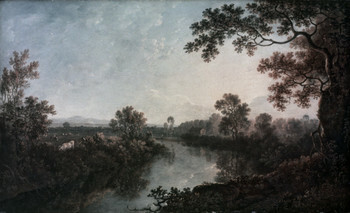 Some of Wilson's landscapes are copies of works by Dughet or Ricci. 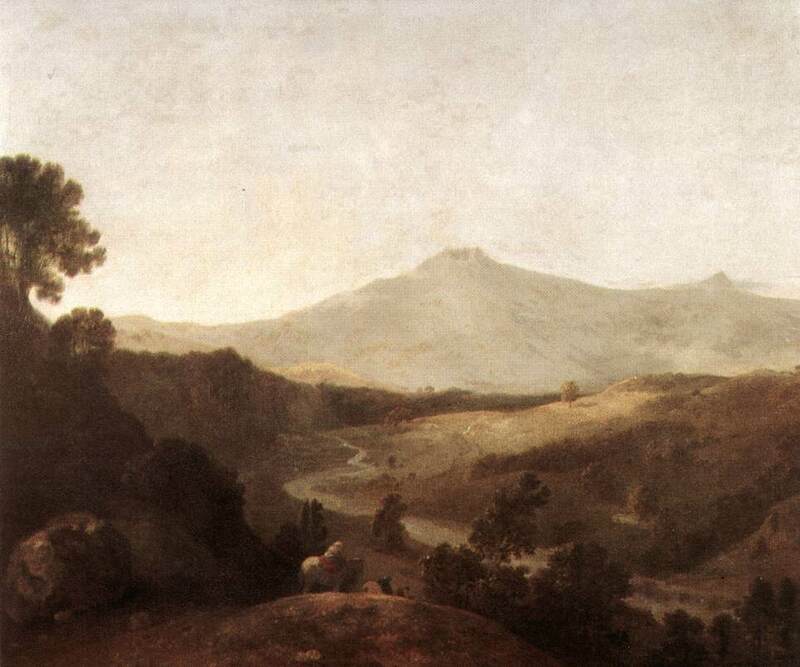 Wilson's landscapes derived from the 17th century Roman school dominated by Claude and Nicolas Poussin. He influenced both Joseph Wright of Derby and Turner. Unlike his contemporary, Gainsborough, and Constable who followed, Wilson showed less interest in the 17th century Dutch "everyday life" school of landscape (Rubens, Ruysdael, etc), but could imitate it when necessary (e.g. On Hounslow Heath). Perhaps the treatment of landscape as areas of light and texture on the canvas, going beyond Claude in drawing attention away from any human activity, was Wilson's subtlest influence on Constable and Turner, both of whom frequently acknowledged their debt to Wilson. Wilson's use of human figures in his paintings is not easy to understand. Superficially, they are there to provide scale and depth to the painting without distracting attention from the landscape. Even in “history” paintings such as Niobe where the dramatic action ought to prevail, the landscape is allowed to dominate. However, Wilson's famous quotation “Do not fall into the common mistake of objecting to Claude's figures” suggests a greater regard for the importance of figure painting. Modern critics are often keen to avoid overstating the influence of Claude on the whole body of Wilson's work, but the most endearing, poetic and immediately attractive of his paintings are those in which Claude's influence is clearest. Art experts of the present-day tend to regard his Welsh and English landscapes most highly. Wilson painted for reactionary landowners and was himself almost certainly politically reactionary. In this light, the dominance of landscape over human figures takes on a new significance. — Wilson's students included also Robert Pollard, Thomas Jones [1743-1803], Jacob More, Francis Wheatley. — Two paintings together in one image Saint-Peter's and the Vatican from the Janiculum / Rome from the Villa Madama (each 70x131cm; together 900x911pix, 102kb) _ These two panoramas portray probably the two most famous prospects of Rome. The first view, that of Saint-Peter's, is taken from the heights of the Janiculum in Trastevere looking north over the Vatican and into the Campagna. In the distance on the horizon is Mount Socrate. The second view, which shows the Villa Madama, is taken from the point at which pilgrims, traveling along the Via Trionfale, first caught sight of the city. The building on the right is the loggia of the Villa Madama which Raphael designed for Pope Clement VII. In the distance lies part of the city with the River Tiber and the distant Alban Hills. In both paintings Wilson characteristically includes some antique fragments in the foreground as a reminder of Rome's glorious past. 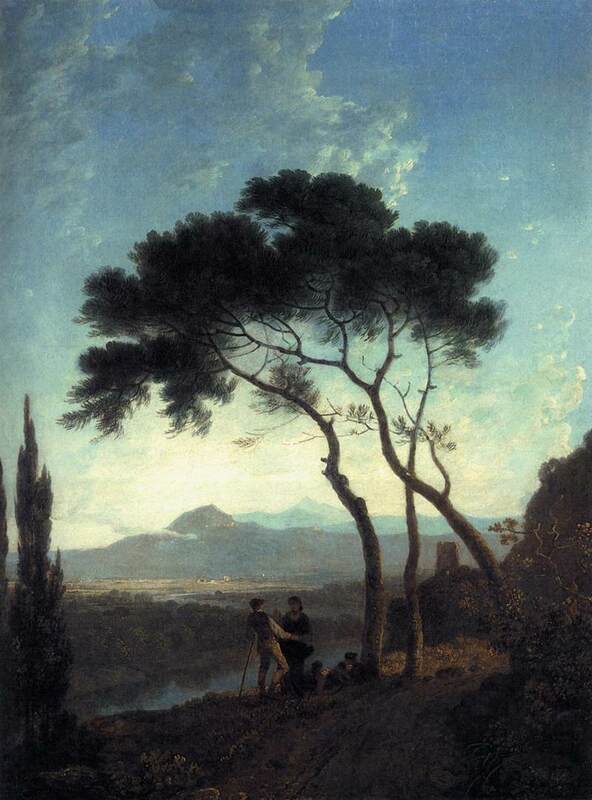 �- S#*> Lake Avernus with People in the Foreground and the Temple of Apollo Beyond (40x52cm; 900x1161pix, 197kb) _ Wilson went to Italy in 1750 and spent a number of years studying the works of Claude Lorrain and others. By the time he had completed the present landscape, circa 1764, Wilson's style had evolved into a sophisticated tension of idealistic and naturalistic elements. In the present picture we see ancient tomb stones leaning tiredly against their structures, a detail which encapsulates a dialectic in Wilson's work between idealised classicism and a decline of classical glory. Lake Avernus is a lake on the Tyrrenhian coast of Italy, only a mile from Cumae, which is supposed to fill the crater of an extinct volcano. Mephitic vapours rise from its waters so that no life is found on its banks. It was because of this that Virgil and the ancient poets believed that Lake Avernus was the entrance to the Underworld. In Virgil's Aeneid, Aeneas sacrifices to the gods in the shadow of the forest surrounding Lake Avernus and then follows the Delphic sibyl into the cave and down into the Underworld. The Temple of Apollo is visible in the present picture. — Snowdon from Llyn Nantlle (1765; 600x760pix _ ZOOM to 1400x1770pix, 479kb) _ This picture of the Nantlle valley shows Llyn Baladeulyn between Craig y Bera and Y Garn with Snowdon in the background. It is the finest Welsh view painted by Wilson. He did not strive for strict topographical accuracy, but rather for a carefully balanced harmony of forms. To achieve this he made alterations to the size and scale of hills and the positioning of trees and people. It is nature mediated by mind rather than simply mirrored in the canvas. — The Inner Temple after the Fire of 4 January 1737 (1737, 65x95cm) _ This picture records the devastation caused by a fire that destroyed Crown-Office Row in the Inner Temple in London during the night of 04 January 1737, fortunately without loss of life. The group in the center includes Frederick, Prince of Wales (in blue, wearing the Garter star), who had sent fifty soldiers to help the firemen and later came to inspect the scene himself. Fires were a regular hazard in London and were fought with water pumps like the one just visible in the left foreground, It had to be filled by hand from the nearby Thames, which was at low tide when the fire began. This added delay, combined with a stiff breeze, made this conflagration more extensive than usual. — Francesco Zuccarelli (1751, 50x42cm; 512x443pix, 25kb) _ This portrait of the Italian landscape painter Zuccarelli [15 Aug 1702 – 30 Dec 1788] was painted when Wilson was working in Italy. Although he later established himself as the leading painter of classical landscapes, Wilson started out as a portrait painter. The rather modest and informal qualities of this image are typical of British portrait painting of this period. Zuccarelli painted literary and mythological landscape scenes and encouraged Wilson to do the same. Like his contemporary Reynolds, Wilson exploited his Italian experience to re-establish himself as a painter in the �grand style� that suited the increasingly pretentious tastes of British art patrons. The composition is indebted to the Neapolitan painter Salvator Rosa [20 Jun 1615 – 15 Mar 1673], noted for his stormy landscapes, often featuring violent acts by robbers. Wilson never allowed his figures to dominate the landscape, and he was displeased when the owner of the picture had the main figure group repainted by another artist, John Hamilton Mortimer [1740 – 04 Feb 1779], to strengthen the human element. ^ Died on 01 August 1857: Charles Turner, English engraver and draftsman, born on 31 July 1774.  Not to be confused with Charles Yardley Turner [25 Nov 1850 – 1919] of the US, nor with THE Joseph Mallord William Turner [23 Apr 1775 – 19 Dec 1851], of whom he was a friend and of whom he engraved some paintings. — In 1789 Charles Turner was apprenticed to John Jones in London, where from 1795 he studied at the Royal Academy Schools. He began publishing his prints in 1796 and also worked in mezzotint, and occasionally in stipple and aquatint for a variety of publishers, mostly in London but also in Scotland and elsewhere. He was a skilful engraver who could adapt his style to reflect that of the painter; he was also hardworking, reliable and enterprising. The speed with which he worked meant that he was able to engrave many plates of topical interest. His first major success was Bonaparte Reviewing the Consular Guards after John James Masquerier [1778�1855], published in 1802 at a time when there were few images of Napoleon available. The painting itself was one that he helped Masquerier to paint, and was supposedly painted from life; in fact it was based on secondary images. 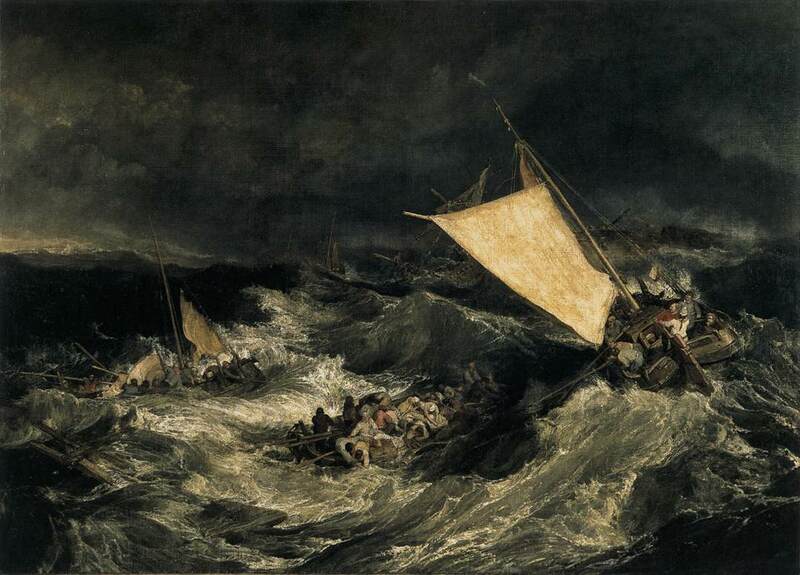 His plate (1807) of .The Shipwreck (1805; 980x1412pix, 66kb) was the first print after the painting The Shipwreck (1805, 171x240cm; 774x1077pix, 123kb) by J. M. W. Turner. in 1828 Charles Turner was appointed Royal Engraver and elected ARA. �- Branch of the Meuse at Li�ge (color aquatint 23x31cm; 830x1194pix, 72kb), after George Arnald [1763-1841] _ Near the church of Saint-Denis, the Pont du Torrent, shown here, was destroyed in 1826, after the filling of the branch of the Meuse which it bridged. — The Rt. Honble. Lady Louisa Manners: In a Peasants Dress (color engraving; 120kb) after John Hoppner [25 Apr 1758 – 23 Jan 1810]. — Charlotte Countess of Cholmondeley and the Hon. Henry Cholmondeley (color engraving; 119kb) after J. Hoppner _ The Honorable is a child, age about 4, in a girl's dress. ^ Born on 01 August 1854: Walter Launt Palmer, US painter who died on 16 April 1932. — Palmer was born in Albany NY, son of the sculptor Erastus Dow Palmer. In his youth he was acquainted with the leading artists of the day such as Frederick E. Church, John Kensett, and John McEntee, all of whom frequented the Palmer home. At age 24, he began his formal study of art with Frederick E. Church, the great Hudson Valley painter. In the early and mid-1870's Palmer traveled and studied extensively in Italy and France. He studied with Carolus-Duran in Paris. He studied the work of the Impressionists as well as that of the expatriate US artists in Europe. He was a friend of John Singer Sargent, with whom he went on at least one sketching trip. He also spent time with John Henry Twatchman, William Merrit Chase, Frank Druveneck, and Robert Blum. Upon Palmer's return to the US in the late 1870's, he and Church rented a studio in New York City. They keep it from 1878 until 1881. Palmer first received major attention for his winter scenes in 1887 when he received the Second Halgarten Prize of the National Academy for his painting January. This award is for outstanding young (under 35) artists with potential. The artist's use of blue shadow in the snow is considered one of the first uses of this technique. He also received the gold medal from the Philadelphia Art club in 1894 and another gold medal from the Boston Art Club in 1895. More awards came from more prestigious Art Associations and his reputation continued to grow. His winter scenes became very popular but his scenes of Venice and interiors were also beautiful and desirable. At the turn of the century Palmer was being compared to Claude Monet and John Henry Twatchman. In 1915, Palmer, now 61 years old, spent the summer in Gloucester Massachusetts, as he would do again in many later summers. His studio was rather quaint and situated on Rocky Neck in Gloucester Harbor. It was described by the Boston Globe in 1923 as one "which hangs down over the rocks and boasts an array of sky blue shutters .. in this studio by the sea." He actually found the summer studio a boost to his art sales as many visitors who came to see, actually bought. He complained that visitors interrupted him but it was good for business. Prices at that time were about $200 each without frames for good sized pictures. One person bought three for a reduced price of $500. He kept meticulous records of all his paintings and sales. He became active in the local art colony and the local art associations, basking in his celebrity status. People would remark that it was strange to see him sitting on his Gloucester Bay dock in the summertime while painting a snow scene. All the while the picturesque harbor's beauty was right in front of him. But he responded that he felt that it was no more inconsistent than many of his fellow artists painting summer scenes in the dead of winter. Walter L. Palmer died in his hometown Albany NY. After his death his work fell out of favor and many museums deaccessioned his paintings in the years following W.W.II. Indeed, by the early 1960's, representational art was out and often the frames were worth more than the paintings. People liked clean walls with no paintings -- a sort of a delayed reaction to the covered wall style of the Victorian period. In the last 20 years the trend has again reversed and the works of US Impressionist and realistic artists of the early 20th century have been rediscovered. Walter Launt Palmer is now recognized as an excellent artist. — Library at Arbor Hill (Olcott Interior) (1878) _ Palmer painted this interior of the home today known as the Ten Broeck Mansion. Seated within is the house's owner, Thomas Worth Olcott [1795-1880], a prominent Albany banker. The furnishings are an eclectic mix of personal possessions, oriental rugs, a Shaker chair, a Japanese screen and a marble bust of Mary Olcott sculpted by Erastus Dow Palmer. Inclusion of the elderly Mr. Olcott reading a morning newspaper gives an idea of his social and economic status; he had both the means to pursue and acquire his possessions and the leisure time to enjoy them. >2005 Constant Anton Nieuwenhuys [21 Jul 1920–], Dutch painter, printmaker and writer. His work was initially conventional in style and included religious subjects. From 1941, however, he became deeply interested in the work of C�zanne, Cubism and German Expressionism, all of which he learnt of through books. During this period he also developed theories concerning art and society, inspired by Marxism. In Paris in autumn 1946 Constant met Asger Jorn. He found confirmation for his ideas in Jorn's work, which was more advanced in its development. As a result fantastic animals appeared in his work from 1946. In November these three artists were the co-founders, in Paris, of the CoBrA movement. Constant set forth his ideas in a manifesto, published in the first issue of the periodical Reflex (1948). Constant's primitivistic work of the CoBrA period (1948-1951) was based primarily on children's drawings. After 1952 Constant's priority was no longer painting and he evolved ideas about a playful living environment for the future. The forms that he used in his work in this period (a few paintings and metal sculptures) are geometric and delineated in flat planes of color. By this time Constant had resumed painting; for some time his work was devoted to frequently disturbing visions of life in the future. The extreme contradictions that the viewer confronts in Constant's work were explained by the painter in Marxist terms as an expression of the dialectic contrast that supposedly governs all life. ^ 1894 Hugo Fredrik Salmson, Swedish artist born on 07 July 1843.  [Was he the Salmson of Salmson and Delilmah?] — He studied at the Akademi f�r de Fria Konsterna in Stockholm (1861�1867) and in 1868, on a scholarship, he went via Copenhagen and D�sseldorf to Paris, where he became a student of the history painter Pierre-Charles Comte [1823�1895]. Salmson was one of the first Swedish painters to be trained in Paris, where he remained. His earlier paintings, for example En repetition af Tartuffe vid hofvet (1881), were experiments in the historical genre of the Salon tradition, but Salmson later became known for his Naturalistic pictures of peasant life inspired by Millet, Jules Breton, and also increasingly by Jules Bastien-Lepage. Hvitbetsrensare i Picardie (1878) caused a stir at the Salon in 1878 and made his name. Its theme is inspired by Max Liebermann�s Workers in a Turnip Field, exhibited at the Salon in 1876, but the latter�s vulgar Naturalism was tempered and slightly idealized in Salmson�s, in the spirit of Millet. Beet Weeders in Picardy has been regarded as an important work in the Swedish plein-air tradition, despite the fact that much of it was painted in the studio, and that the figures, harshly outlined against the cloudy grey sky, take up somewhat theatrical poses. A preliminary study in G�teborg Konstmuseum has greater spontaneity. After his success with Beet Weeders, Salmson painted a large number of peasant scenes, taking his subjects from Picardy or from Sk�ne in southern Sweden, where he spent most of his summers from about 1883. Such works as Vid spinnrocken (At the Spinning Wheel) (1883), with richly varied shades of gray, show a method of design and color treatment often reminiscent of Bastien-Lepage. Salmson also painted pure landscapes and portraits, including two self-portraits, one of them in 1870. 1893 (02 Aug 1887?) 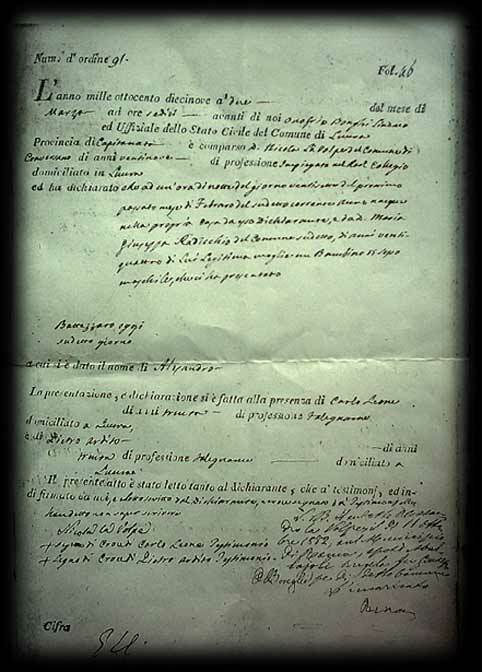 Alessandro La Volpe, Italian painter born on 28 February 1819 (facsimile of birth certificate). A landscape painter who turned his focus primarily to Italian sites and monuments, La Volpe was a master at reproducing the brilliant light and dry climate of his native Italy. He was born in Lucera, son of an employee of the Real Collegio. After finishing his studies, La Volpe moved to Naples and entered Accademia delle Belle Arti, where he studied under Salvatore Fergola [1799-1874], the official painter of ceremonies of the French Monarchy at Naples. He began exhibiting in Naples in 1848 and in 1850, La Volpe was sent to Sicily and Egypt on an official mission with the Prince of Linchtenberg to record important monuments. The assignment of such a mission revealed an appreciation for La Volpe’s meticulous attention to detail as well as his skill as an accomplished painter. Upon his return to Italy, La Volpe moved to Florence, where he helped to found the Scuola di Staggia, a school of Romantic landscape painters. Sketching en plein air in the 1850s and 1860s, his work was characterized by a tendency to depict identifiable, usually picturesque locales in the Tuscan countryside, while focusing on specific peculiarities and everyday aspects, and was informally termed the Scuola di Staggia. The name Staggia is derived from a village in the hilly region near Siena where Károly Markó first painted in 1853, later joined in about 1854-1855 by his sons Károly Markó II and András Markó and other painters from Florence and Naples, stimulating an exchange of ideas between the artists of the Neapolitan school and their Tuscan colleagues, a significant step in the development of landscape painting in Italy in the latter part of the 19th century. The school is significant for having been one of the earliest instances in Tuscany of a group of artists painting together from nature, a fact that greatly influenced the practices of the Macchiaioli. The Macchiaioli was a group of Italian artists primarily active in Florence (circa 1855-65). Influenced by members of the Barbizon school, the Macchiaioli reacted against stilted academic art and worked to emphasize painterly immediacy and freshness and were best known for their landscapes, portraits, and genre scenes. The aim of the school was to reproduce “truth” in painting through a planned, precise technique and naïve, accurate way of viewing. The birth of the Scuola di Staggia put Naples in concert with mid-century trends in Paris and the US. — View of Taormina (1883, 75x133cm; 450x804pix, 114kb) _ La Volpe�s tendency to naturalism is apparent in this image. The location and condition of the ruins of this Greek colony on Sicily are carefully recorded: columns and walls overgrown with greenery are depicted with firm drawing while the snowy peak of Mt. Etna and the shimmering blue of the Mediterranean glow in the distance. Still, La Volpe�s precision does not detract from his interest in light and atmosphere, two leanings that make his work recall Corot�s Italian views. 1790 Jacob van Lint, Flemish painter born on 08 February 1723, son of Hendrik Frans van Lint “lo Studio” [1684-1763]. Jacob (or Giacomo) van Lint earned his reputation as a vedutista, painting detailed topographical views of Rome in the manner of his father and of other contemporaries such as Gaspar van Wittel (“Vanvitelli”). — Were they descended from Pieter van Lint [28 Jun 1609 – 25 Sep 1690]? �- S#*> View of the Ponte Rotto (28x45cm; _ ZOOM to 900x1418pix, 248kb) _ The dome of Saint-Peter's is seen in the distance. Van Lint made another version, of larger dimensions and conceived as a pendant to a View of the Basilica of Maxentius. The staffage is different in each version but the viewpoint and inclusion of bathers in the foreground are the same. The handling of water, not dissimilar to that in Vanvitelli's own paintings, is very close to that in Giacomo van Lint's View of the Ponte Sisto. �- S#*> Veduta dell'abside di San Pietro con un artista in primo piano (31x47cm; 560x880pix, 95kb) _ Van Lint made another version, seen from somewhat further. Questa veduta di San Pietro, che rifiuta l'aspetto pi� convenzionale della facciata della Basilica con la sua piazza colonnata in favore di una veduta che invece guarda verso il nord della citt�, � abbastanza inusuale nel vedutismo settecentesco. In lontananza si vede il Colle Vaticano, che nei tempi di Giacomo van Lint fu chiamato l'Orto della Fabbrica, e la rappresentazione degli edifici in primo piano � in tutta probabilit� abbastanza fedele. La figurina di un artista in primo piano, che parla con un monaco, potrebbe rappresentare l'artista stesso. �- S#*> View of the Piazza Colonna (35x45cm; 601x800pix, 85kb) almost monochrome. Van Lint made another version, with differences and of larger size. �- The Colosseum (50x42cm; 765x636pix, 45kb) _ Hendrick van Lint depicted The Colosseum from a similar viewpoint on a number of occasions, however the present depiction, the only one by Jacob van Lint, does not derive from them, given that it incorporates a number of changes in the buildings since his father painted the same scene. �- Castel Sant'Angelo (50x42cm; 765x639pix, 62kb) _ This is the only known view of The Castel Sant'Angelo by Giacomo van Lint. The depiction of from the south is unique to Jacob and Hendrik van Lint, and shows a view of the castle across the Ponte Sant'Angelo. The decoration of this elegant bridge was commissioned from Bernini by Clement IX, although Bernini himself sculpted only two of the ten angels, each carrying symbols of the Passion, which in 1729 were removed to the Chiesa di San Andrea delle Fratte, Rome. 1494 Giovanni Santi, mediocre Urbino painter and poet at the court of art patron prince Frederico da Montefeltre. Giovanni Santi was born in 1435.  He was the father of Raffaello Santi THE Raphael [06 Apr 1483  06 Apr 1520].  Giovanni Santi was well known in artistic circles in Urbino. His works contain motifs from various sources, among them Perugino [1445  1523] and Melozzo da Forlí [1438  1494]. Two artists were working in his workshop during Raphael's childhood: Evangelista da Pian di Meleto [1445  1523] and Timoteo Viti da Urbino.The latter undoubtedly more deeply influenced the very young Raphael. ^ >1920 James Pichette, French painter who died on 02 August 1996. Premier fils de Joseph Pichette, originaire du Qu�bec, et d'Andr�e Bleinat, n�moise. Il passe, sa prime jeunesse � Ch�teauroux, son adolescence � Lyon; jeune homme, il fait des �tudes secondaires � Marseille. Des suites de la guerre, qu'il fait au 41" G.R.D.I. en 1939-1940, il est contraint � un s�jour prolong� en haute montagne savoyarde. C'est l�, en 1942, qu'il commence � peindre des tableaux tout figuratifs. Il revient dans sa province natale et s'installe, en 1943, � Aigurande. Contacts avec la R�sistance, il participe � des parachutages. Apr�s la lib�ration de Paris, il rentre dans la capitale. En 1947, il expose pour la premi�re fois au Salon des Surind�pendants. La m�me ann�e, il part pour l'Italie et, passant par Florence, il s�journe plusieurs mois � Rome. Il travaille dans les studios de la Cinecitta et fr�quente les ateliers de la via Margutta, fait la connaissance de Cagli, Turcato, Consagra, Afro, Santamaso, et d'Alberto Savinio. Premi�res oeuvres abstraites. Gino Severini, Alberto Magnelli, Jacques Villon, Max-Pol Fouchet, qui pr�face sa premi�re exposition personnelle � Paris, en 1949, Charles Estienne, � qui il doit sa premi�re critique, ont encourag� ses d�buts. Il est invit� � participer au V" Salon des R�alit�s Nouvelles en 1950. Il obtient en 1952, une bourse d'�tudes pour les Pays-Bas et devient pensionnaire de la Maison Descartes, � Amsterdam. Il voyage dans de nombreux pays europ�ens, plus particuli�rement en Italie, pays de pr�di�lection, puis aux Etats-Unis et au Maghreb. Install� � New York en 1960,il s'impr�gne du Jazz. De retour en France, Il r�alise quelques toiles sur le th�me du jazz jusqu'au jour o�, gr�ce au peintre Jean Berthier, il d�cide de participer � une s�rie de happenings. Il collabore alors � diff�rentes exp�riences de jazz-peinture dont le premier festival de Free jazz qui se tient � Bobino en janvier 1967. En 1956, il fait sa premi�re oeuvre graphique, 11 con�oit en 1961 un dispositif sc�nique pour Guerre et Po�sie, montage po�tique de son fr�re, � l'Od�on- Th��tre de France. Il r�alise sa premi�re oeuvre monumentale � Vitry-sur-Seine, en 1971. Il est charg� de cours pendant plusieurs mois en 1976, � l'Ecole Nationale d'Art D�coratif, � Nice. Il expose r�guli�rement au Salon des Grands et Jeunes d'Aujour�d'hui et au Salon de Mai. . Le cercle fait son apparition en 1970.En 1985, c'est le d�but de l '" Espace jazzique"; un nouveau lyrisme, mais un lyrisme plus resserr� que celui de la p�riode 1960-1968. ^ 1865 Prince Eugén Napoleon Nicolaus Bernadotte, Swedish artist who died on 17 August 1947. Svensk-norsk arffurste, hertig af N�rike, artist. Den fj�rde i ordningen af Oscar II:s s�ner. F�dd p� Drottningholms slott d. 01 aug. 1865. Prins E. aflade studentexamen 1884, tillbragte v�rterminen samma �r vid Kristiania universitet och tog s. �. officersexamen. 1856 Daniel Hernández Morrillo, Peruvian painter and draftsman who died on 23 October 1932. In 1860 he was brought to Lima and at an early age displayed considerable artistic talent. In 1870 he started studying under the Italian painter Leonardo Barbieri, and in 1875 he went to Europe to study under Lorenzo Valle, having won a scholarship from the Peruvian government. In Paris he met Ignacio Merino, who recommended that he study in Rome. He spent ten years in Italy absorbing the aesthetics of Classical art then returned to Paris, where he met Mariano Fortuny y Marsal, Francisco Pradilla, Armando Villegas and others. He took part in numerous exhibitions, particularly Artistes Fran�ais, where he was commended in 1890; he won the gold medal at the Exposition Universelle in 1900 and in 1901 he was awarded the Légion d�Honneur. From 1912 he spent some time in Montevideo and Buenos Aires, returning to Europe in 1914. In 1917 he settled in Lima and in 1919 set up the Escuela Nacional de Bellas Artes at the invitation of President Jos� Pardo, continuing as its Director until his death. His works include watercolors, drawings, and murals, and his themes range from seascapes, landscapes, still-lifes, and historical paintings, to portraits. He is perhaps best known for his Reclining Women series, typical of which is Reclining Woman (1902). His portraits included D. Nicol�s de Pi�rola (1889) and Sra. Mesones (1883). His work has been criticized for portraying a slightly idealized, superficial world; he was concerned with the strength of the lines, sincerity of vision, and avoiding frivolous preoccupation with superfluous details. — The students of Hernández Morrillo included Enrique Camino Brent, Carlos Quispez As�n, Sabino Springuett, Jorge Vinatea Reinoso. >1837 Jos� Mar�a Galv�n y Candela, Spanish painter and engraver who died on 11 October 1899. His skill as an engraver was such that in 1874 he was able to make such a perfect engraving after Muerte de Lucrecia (1871, 257x347cm; 440x600pix, 33kb) of Eduardo Rosales Gallina [04 Nov 1836 – 13 Sep 1873], that the 50-peseta banknotes printed with Galván's engraving were never detected as forgeries, at least during his life. — Realizó sus estudios en la Escuela Superior de Bellas Artes de San Fernando de Madrid y en el taller de Luis Fagundez. En 1860, obtuvo tercera medalla en la Exposición Nacional por Virgen con el Niño en brazos. A pesar de este buen inicio, su carácter independiente le acarreó problemas a la hora de presentarse a oposiciones para pensiones en la Academia de Roma para cátedras en escuelas de bellas artes. El desánimo que el reiterado fracaso le produjo, le llevó a aceptar un puesto de grabador en la sección de Hidrografía en el que destacó pronto, especialmente en lo que a la técnica de aguafuerte se refiere. 1495 Jan van Scorel, Dutch painter who died (full coverage) on 06 December 1562.